These 5 & 10 string kanteles are built in a small shop in the woods a few miles north of Lake Superior. They are quality instruments that will bring joy to both the players and listeners. The instruments are made from a variety of woods: pine, fir, walnut, birch, and cherry. They are oiled with Danish oil, then waxed to a matte finish. None of the instruments are exactly the same. FIVE STRING: Five string instruments are relatively easy to learn and play since they have only five notes. (Kanteles are not fretted instruments - there is only one tone per string.) The Finns and other Baltic area peoples used these beautiful sounding instruments most often to accompany singing and reciting their old poems. They have the capability for playing three chords: the I, the V and the IV. The tuning range is between D and G. When sent out to a purchaser, the kantele is tuned so that the strings are D,E,F#,G,A. However, a variety of tunings can be made on these instruments. The standard 5-string kantele ($165 for an open bottom model, $185 for one with a bottom and a soundhole in the top) is about 22 inches long, 2.5 inches deep at the deepest part, and about 4 inches wide at the widest part. TEN STRING: Ten string instruments give a player the opportunity to play many more tunes than a five string. Kanteles with more strings developed as the Finns and their neighbors desired to play "European" style tunes. The open bottom 10-string kantele ($285) is about 2.5 inches deep, 28 inches long, and about 6.5 inches wide at its widest point. The closed bottom 10 string model ($375, or $500 with Kontos gigbag and electronic tuner) is the same depth and width, but about 32" long. They are shipped tuned in the key of D, but the tuning can be modified (see the Guide to Playing Small Kanteles on this website). The traditional Finnish tuning of a ten string kantele omits the seventh note of the scale. Thus the tuning is: A,B,C#,D,E,F#,G,A,B,D. A tuning key wrench is included with the instrument. 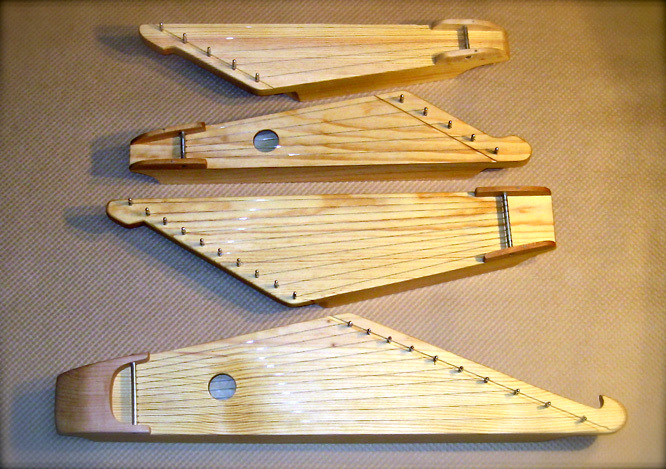 The difference between an open and a closed bottom kantele is primarily visual - the quality of sound in each remains the same. A tuning key wrench is included with the instrument.